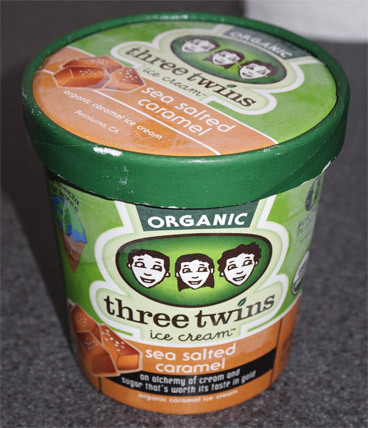 Let's start with a quick recap: Three Twins is a west coast ice cream company churning out premium organic ice cream. They have several locations as well as 13 prepackaged flavors. The owner was nice enough to send me a few coupons to try out their stuff now that they've gone national with the help of Whole Foods grocery stores. First I dug into their very respectable vanilla bean flavor, and now it's time for flavor #2. Funny, I just noticed it says sea SALTED caramel (as opposed to sea SALT caramel). I like the description too "an alchemy of cream and sugar that's worth its taste in gold". Now that's just some snazzy wordsmithin'. --- If it's too snazzy for you, it says "organic caramel ice cream" underneath. Nice touch three twins. I love a good description, but a backup straightforward description is a nice little touch. Nothing too out of the ordinary at first glance, just a uniform color and a spot where it must have froze funny after the trip home. I take a whiff and it's got a nice caramel smell to it. Let's dig in. Mmmm, one bite down.... 3 bites down.... it's actually fairly mellow and not dry like Talenti's take on caramel. In fact, I'm getting a very strong milk vibe to every bite. Different, definitely different. Now sometimes the caramel has that hint of burnt to it, but its just a hint, no worries. It's really about the milk on this first scooping. There's always something that sticks out in your mind when you first try a flavor, and right now, it's the caramel milk vibe. You know, its such a unique caramel that I almost need something to break it up. I'm already dying for a pretzel or maybe some dark chocolate chips... now I'm having flashbacks to Wonka caramel nut kadoozle... I'm missing though sweet and crunchy bits scattered through... I think the problem is that I've never had a straight caramel flavor, everyone always mixes something in. Let's step back for a second and look how little air is in this pint. This pint was really nicely done. I want to say this is the simple, mature, caramel flavor you may have hoped someone to come out with but never did. The caramel is treated with respect and delivered with a solid, milky texture and a nice mildly flavor. There's even a caramel aftertaste worthy of a worther's. Nice Job. On Second Scoop: Look, this is a nice ice cream, I don't need to sell you on it because I think you are either going "I don't like caramel" or "finally, a simple yet worthy caramel flavor". 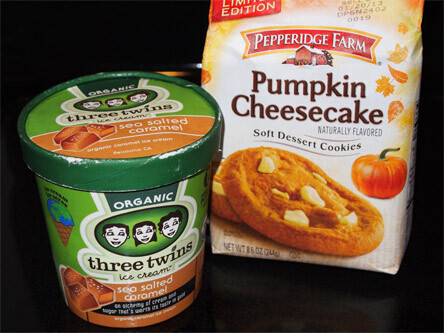 Earlier this week, Junk Food Guy did a post about the brand new limited edition Pumpkin Cheesecake cookies from Pepperidge Farm. I love pumpkin pie and pumpkin bread, so a pumpkin cookie? Yeah, I'm all for that and immediately began my search. After 3 or 4 attempts, I score a bag of cookies. I open the bag, grab the smaller then expected cookie, and dig in. Well, it started a little slow for me, but once you hit those cheesecake bites, ooo, good times. They are almost like a soft chunk of white chocolate. Mmm, blends so well, big fan, give 'em a try. Wait, we're not done yet. The always curious Nick says to me "these need to be in an ice cream sandwich". Interesting. I think about it for a moment and go "I think I have just the ice cream for that". 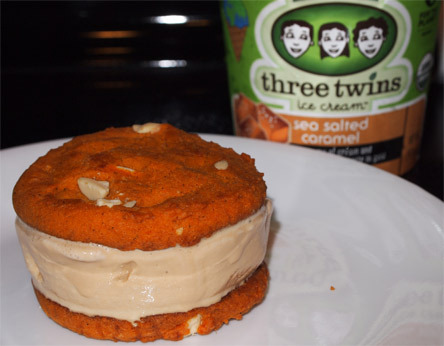 Behold, the mighty pumpkin caramel ice cream sandwich. First, I threw a pair of cookies in the toaster oven to crunch them up (it didn't work, they got softer). While they were warming, I pulled the ice cream out of the container and sliced off the bottom inch to create the perfect slab of ice cream sandwich filling. Awesome idea Nick, you totally called it on this one. The main flavor is pumpkin, but I got the cookie to cream ratio just right and everything tied together beautifully.... I shared it with my wife and she thought that I had brought it home from the store because it was so good. This one's a winner everyone, go try it for yourself. THAT IS THE GREATEST COMBINATION I HAVE EVER SEEN! 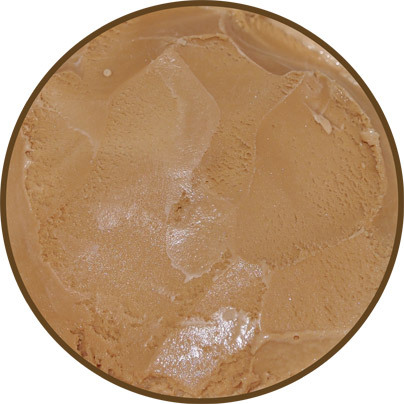 That ice cream looks amazing - very smooth in texture and a dark caramel color which is how caramel ice cream should look. 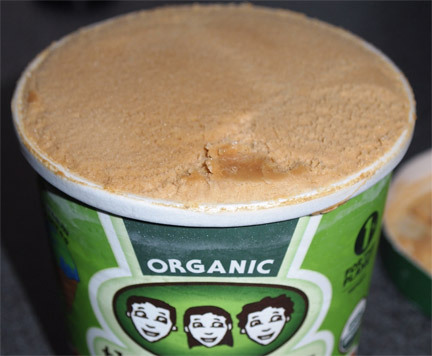 It doesn't look like your typical store bought frozen container of ice cream which sometimes has been marred by ice or frozen crystals. I saw this brand in stores at Whole Foods, but again, the high price scared me away, so I am glad you reviewed this because now I know that if I should ever buy a pint that I will be receiving a good quality product. THANK YOU for that ice cream sandwich idea! I bought this flavor a few weeks ago (tempted by a sale at Whole Foods) and had pretty much the same opinion as you. I think I even called it milky too. But I got bored of it and still have some left, so I'll be on the lookout for some of those cookies..